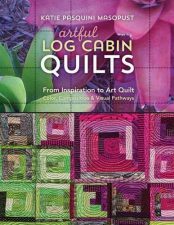 A prolific author, Katie shares her enthusiasm for the art of creative quilting through her numerous books, her many classes, and now as a member of the Experius Academy Advisory Council as they work to develop the art mission for the new Gateway Canyons Resort in Colorado. Katie has a large collection of books and supplies to choose from. Learn 10 different techniques to create art quilts by interpreting still life arrangements. Unlock your inner artist with Katie’s abstracting techniques. Use a variety of art supplies to create designs that have personal meaning to you. Ten can’t-miss design techniques for art quilters. 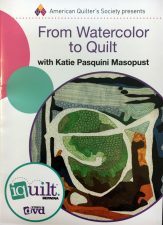 Bring out your inner artist- explore ten approaches to designing art quilts with world-renowned teacher Katie Pasquini Masopust. Techniques that work for everyone, from beginner to advanced. What you’ve been waiting for – composition and color explained in clear, understandable language. 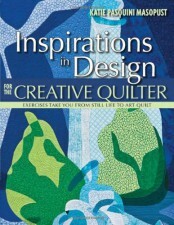 Quilt no-sew design exercises to make your talents shine. Build a color wheel from fabric to learn color principles. Discover the easy “Nine-Patches” of color and composition. Traditional quilter? Art quilter? 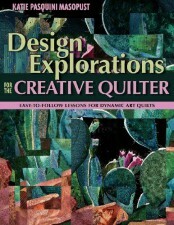 Improve ANY quilt with this book. Your quilts will gain an air of mystery with this innovative 3-step technique for adding layers of visual interest to representational quilts. Simple steps will take your quilts to a new artful level. 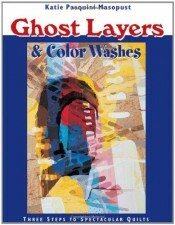 Add a ghost layer that is lighter or darker than the base block’s colors. 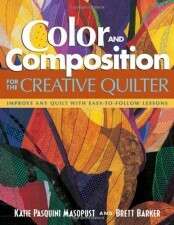 Create a color wash that allows use of even more colors in the quilt. Katie has changed her style once again. She is doing landscapes that are broken up or “fractured” to make them more surreal. The pieces are machined quilted in the fractured section for ease of construction. 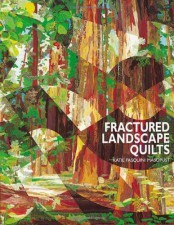 Over 80 photos of Katie’s and her students landscape quilts. Even a pattern to get you started. 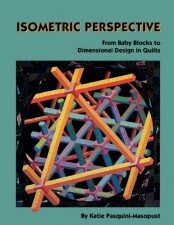 Isometric design is a way of creating dimensional quilts based on the isometric grid. This book explains how to use grid graph paper and tracing paper to create illusions of space. 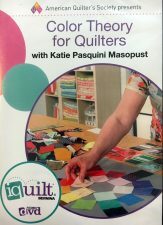 There are over 10 lessons on different isometric blocks, 80 pages, 35 plates of Katie’s and others quilts and a pattern for the popular “Nuts and Bolts” quilt. This title is out of print. 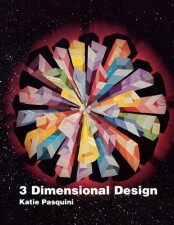 Get these two titles: Isometric Perspective and 3 Dimensional Design reprinted by the author, spiral bound, for $28.00 EACH title. 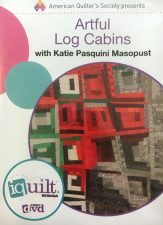 Join Katie as she combines her love of art and Log Cabin quilts in this creative class! First, she will guide you as you select an inspiration photo or painting. These Log Cabin designs can be made in square, diagonal, or wonky formats, giving a distinctive look to your project. Gathering the fabrics can be so much fun, and adding specialty fabrics is a great way to add some shimmer and shine. Cutting strips and doing simple, straight-line stitching moves along quickly, so in no time at all, this quilt top will be constructed and ready to quilt! 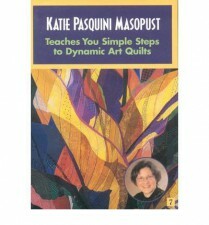 Katie shows lots of quilts done in this approach, which provides ideas and additional inspiration. All the while, learn about composition and color value from one of the finest instructors in the industry. This is a wonderfully enjoyable class for beginners or experienced quilters alike. Develop your own sense of color with Katie Pasquini Masopust in this inspiring tutorial. While Katie teaches, she suggests practice exercises to apply what is being presented. Create a fabric color wheel while learning about the placement and interaction of color. Value is explained, along with classic color schemes. View multiple types of composition and study colors emerging from nature. Then, explore the true magic of color with examples of transparency. The interactive approach ensures that the content offered in this class will affect the way you see color in your projects and build confidence about your own color choices. Create abstract watercolor paintings using eight different painting techniques. Combine these techniques and multiply the fun. Play with bubbles, cups, rubber cement, masking fluid, air, gravity, stamps, and ink to produce a collection of colorful paintings. Then, choose one favorite and crop it to find the most dynamic part. Katie shows how to enlarge the area, make templates, and turn that watercolor creation into a fabulous art quilt. Learn how to choose and place the fabrics, building from the top down, until you have a quilt that looks like a watercolor painting! The best part? No painting experience is needed, so jump in and turn yourself into a painter and art quilter all in one exciting class! This is a fun class that produces stunning results even if you’ve never worked with acrylic paints. 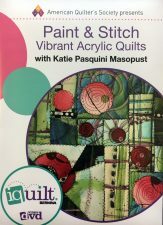 Combine painting with acrylics and easy quilting with Katie Pasquini Masopust. With her expert guidance, choose a color scheme and make three different paintings by layering paints and fabrics. Then, use Katie’s method to cut the canvases apart and sew them together to create a complex composition. Her technique lends itself well to geometric designs, still lifes, and landscapes. Next, layer your project with batting and backing, and quilt it as you prefer. Katie demonstrates how the final piece may be stretched onto a frame and hung. If you prefer to use the stitched canvas in other ways, she also gives instructions on how to cover books or calendars for personalized gift giving and even how to make her six-minute zippered bag! A non greasy marking pencil that is great for marking quilting lines. For marking the cutting or sewing line, Green, for marking on Warm colors, Red for Cool colors and White for dark.